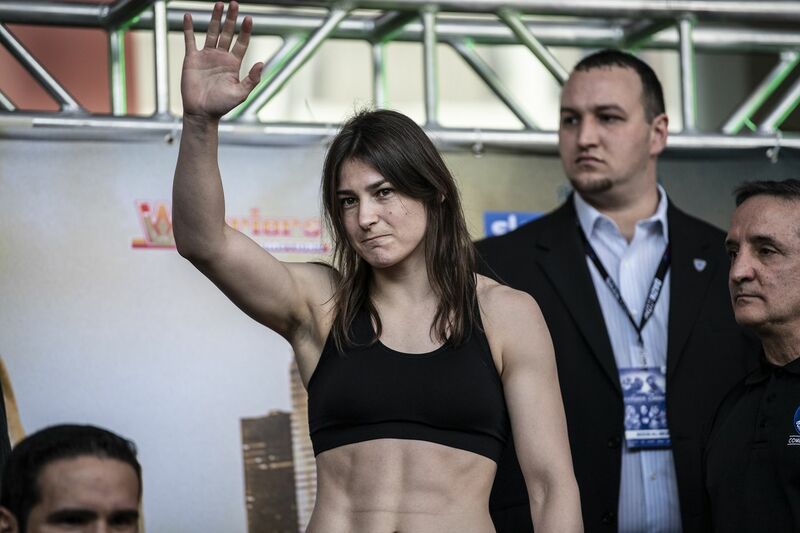 Katie Taylor, an undefeated Irish lightweight world champion, waves during a pre-fight weigh-in at the Liacouras Center in Philadelphia Pa.
Katie Taylor has fought for an Olympic gold medal, carried the Irish flag in the 2012 opening ceremonies in London, won her first world title at Wembley Stadium, and is ranked the fourth-best pound-for-pound women’s boxer in the world. But earlier this week, the 32-year-old undefeated lightweight (12-0, five knockouts) did something she’d never done before. She ran up the Art Museum steps and posed next to the Rocky statue. Taylor takes on World Boxing Organization champion Rose Volante (14-0, 8 KOs) Friday at the Liacouras Center in a nine-fight card headlined by Philadelphia super featherweight Tevin Farmer (28-4-1, 6 KOs) and Jono Carroll (16-0-1, 3 KOs) with the International Boxing Federation title at stake. Irish boxer Katie Taylor poses with the Rocky statue outside of the Art Museum ahead of her March 15 fight at the Liacouras Center. Holding both the IBF and World Boxing Association titles in the lightweight division, Taylor hopes her fight with Volante is the next step in claiming all four lightweight belts. With a win, Taylor would fight World Boxing Council titlist Delfine Persoon (43-1, 18 KOs) to become the undisputed champ. Philadelphia middleweight Gabriel Rosado (24-11-1, 14 KOs) rounds out the top of the card, fighting Maciej Suleki (27-1, 11 KOs). Taylor is a pioneer for women’s boxing in Ireland and around the world. She was a part of the first women’s boxing events in the 2012 Olympics, becoming the first woman to win the lightweight gold medal. “Women’s boxing is absolutely flying right now and the main reason for that is Katie Taylor," Eddie Hearn, the promoter and organizer of the fight, said at a Wednesday news conference. "Not only did she force women’s boxing into the Olympics, but she forced women’s boxing in front of the networks, broadcasters, sponsors, and fans and showed them how entertaining women’s boxing can be. “She is, in my opinion, one of the most entertaining fighters on the planet." Taylor was a part of the push to bring women’s boxing to the Olympics, and said she was shocked when it wasn’t added to the 2008 Games in Beijing. The Olympic Committee’s executive board added the sport four years later. Carrying the Irish flag in the opening ceremonies before winning gold, Taylor became a national star. During the match that secured a bronze medal for the Bray, Ireland, native, fans set an Olympic noise record. “You see a lot more girls turning to boxing instead of another sport,” said Taylor’s trainer, Ross Enamait, on the impact Taylor has had on her country. “She’s a gold medalist, that’s the ultimate dream for a lot of young athletes. ... They’re still talking about it now."